This newly translated fairy tale by Hungarian Ervin Lázár didn’t, in all honesty, attract me with its title (the princess sounded more like a homeopathic remedy) nor with the illustrations (which grew on me rather when I read the book), but that brief dip into the text that I like to do, made it look both fun and intelligent. And that’s how it turned out to be. 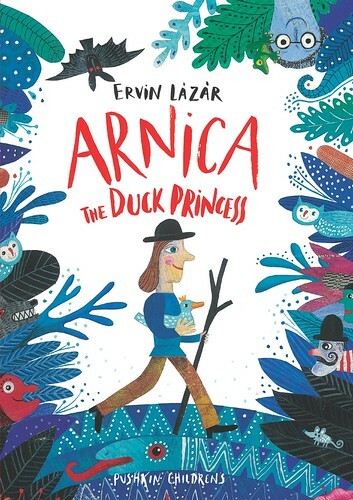 The style of writing is refreshingly modern and amusing, and the plot does have a poor young man for the Princess Arnica, but there are no three* brothers, nor any stupid or unkind parents. The King is lovely, in fact. Very sensible and kind and fair. Arnica herself is apparently not all that beautiful, or at least not until Poor Johnny, as the hero is called, sees her and falls instantly in love, and that makes her beautiful. Poor Johnny is poor, but the King does not mind this. All would be just great were it not for the wicked Witch,** who casts a spell making the young couple into ducks. But being so very much in love, they decide to take turns being a duck. And eventually, after many charmingly different little adventures, the two leave their duck-ness behind and everyone lives happily ever after. What’s so attractive, apart from the fun story, is the language. I have no way of knowing if this is the style of Ervin Lázár, capably translated by Anna Bentley, or if there is some magic happening in the translation. There is an unusual plot device in that in every chapter the author appears to be chatting to a child about how to proceed and what certain things mean, sometimes having new ideas or names introduced into the story, the way a child might come up with odd little things. It’s really very charming. And as I said, the illustrations by Jacqueline Molnár turn out to be exactly what the book needs. **The Witch, well, she’s really bad. Mostly. ‘Hello,’ they say. Not ‘do you want to sign in,’ as they do in English schools. 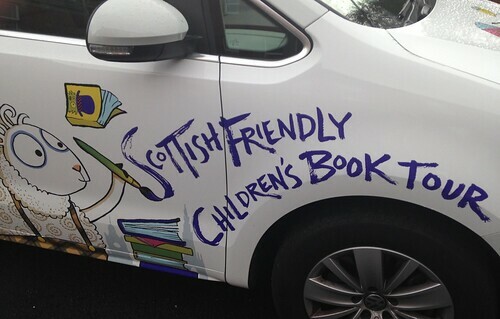 That’s what so friendly about Scotland, like this week’s Scottish Friendly tour, where Scottish Book Trust are driving Children’s Laureate Lauren Child (see how those words and her name sort of go together?) all over Central-ish Scotland. Same procedure as every tour; five days, one school in the morning and one in the afternoon. Apparently it can be hard to remember whether you just said what you just said, or if that was in the last place. Except it wasn’t pizza this time. And the Burgh Coffee House was full, even with Scottish Book Trust’s Tom & Co looking pointedly at the table-hoggers there, so they repaired to the new place across the street, where I joined them, having a latte as they worked their way through avocado toast with whipped cream. Ah, no, it was actually poached eggs. Looked like cream. 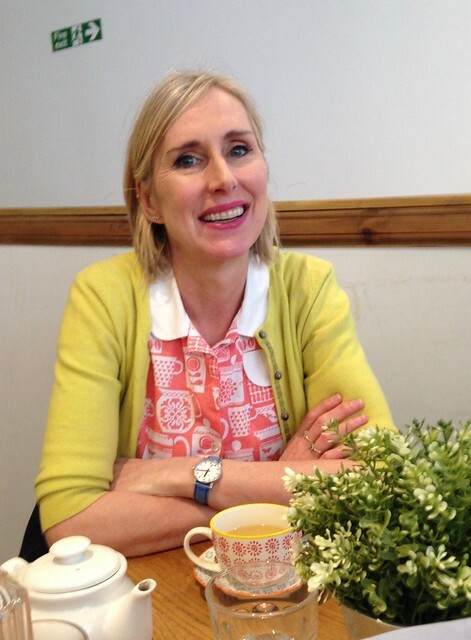 And Lauren Child took to having a random witch join her like the professional she is. We started by agreeing how strange it was that after all these years, we’d never been in the same place at the same time before. A witch should always aspire to someone new. Her Charlie and Lola books, and subsequent television series, were too late for Offspring [and me]. I had perused Lauren’s website before the meeting and discovered that I am not the only one to believe she’s American. She’s not. I deduced from her description of a very long radio interview she’d done with someone once, that she might be from Wiltshire. Apparently it matters where you come from, as it does which part of London you live in now. I’d been hoping to ask a really good question, but Lauren beat me to it and asked one of me instead… ‘Who do you still hope to meet?’ My answer should have been, ‘after you, no one.’ But I wasn’t that alert at that moment. Lauren has done what she wanted to do as Children’s Laureate, which is great. She’s at ‘the end’ now, and reckons she managed her goal by not setting such a crazy pace as her predecessor did. In fact, Lauren said it’d be better if the Laureate could stay on for longer than the two years, making it easier to have bigger goals, and for them to be successful. She can also think of who might be good to take over after her, but is far too discreet to mention names. Although, she did say she feels it would be better not to choose the really big names, as someone slightly less famous could have more time to do the work. I asked if it helps being known from television when she goes into schools, and it does. Sometimes children can take time to decide that an author is worth listening to, so if they already know about them, that helps. Lauren’s entourage this week consists of three helpers, making her look terribly important. Scottish Book Trust’s Tom had managed to get two assistants to carry the books for him, which is good going for someone who drank Choconana two and a half years ago. Yesterday he had what looked suspiciously like some kind of coffee. And the café gave them two free slices of chocolate and beetroot cake. Because it was Wednesday. As always, I stayed for far longer than I should have. (I blame the nice company.) And I turned down their kind offer to smuggle me into that afternoon’s primary school. It was good to have met Lauren, after so much time. And she looked lovely, dressed for spring, and far too sensible in a London and Wiltshire kind of way to even contemplate milkshakes. I’d say some sort of green tea? £250? Really? It seems that’s what I should charge for a post on Bookwitch. I took part in a blog survey a while back, and have now been sent the results, and see that I am doing most of it wrong. I’m too old. This is not my main source of income. I use too much time per week on this, my little hobby. And, er, it’s on the wrong subject. Books do not feature as the top half dozen. Probably not even the next half dozen, either, to be honest. In some way I can’t get my head round this. What else but books could a person want to write about? And how could I tell people I’d like them to pay me money for writing a blog post? I barely let anyone near the witchy ‘print works’ as it is. Compared to the £250, the [publisher’s] cost of a book plus postage is small change, and I Must Stop Feeling Guilty! Just think how much an advertisement for that same book would be in the press. When I’d got this far, I happened to read about the children earning vast amounts of money on YouTube and the like, where they either just look cute, or they open boxes of toys and look cute at the same time. Or they get sent designer clothes in the hopes that they will appear online wearing them. Even the £250 is beginning to look puny. I’m not cute. I might have been 62 years ago, but haven’t worn well. So I’ll review your next book for free. If it’s a good book. As I’m thinking of possibly heading into a bookshop today, this could prove an expensive day. Except, I just remembered I vowed to not get into the Water-stones lift again. It’ll have to be the Post Office, where just the other day they were surprised by the sudden run on International Driver’s Licences. It’s not easy, is it? Did I really want to read about a duck struck by a meteorite? 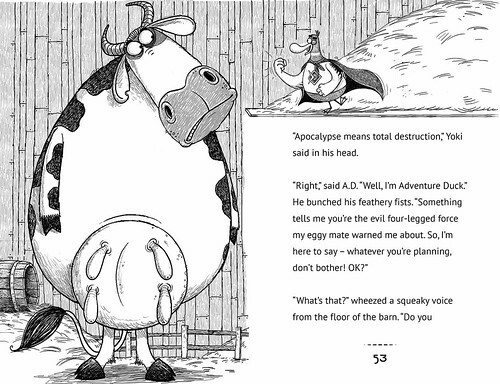 It promised to be quite a silly book. 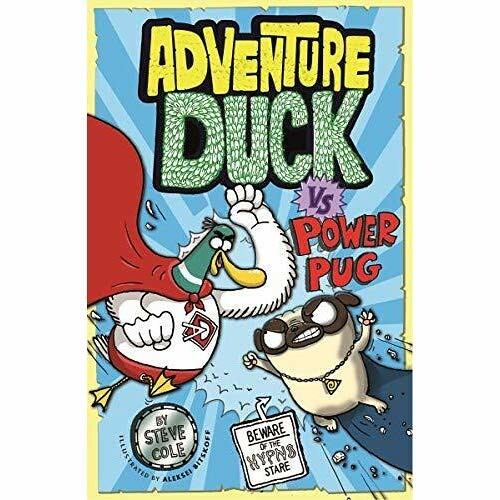 But then, Adventure Duck vs Power Pug is by Steve Cole, and we like Steve Cole. So they all came with me to the GP’s waiting room yesterday, and luckily the nurse was distracted by her friends over lunch and was late, allowing me to read on. By page 39 we’d just got to the cool secret camp the meteorite-stricken egg (yes, really) had organised for himself and Adventure Duck – who, between you and me is a silly duck – and I didn’t particularly want to get up from my reading. As you will have gathered I have yet again fallen under the super-powers of Steve Cole, and you wouldn’t know I am really an adult. The illustrations by Aleksei Bitskoff are suitably crazy too. The Scots Magazine arrived at Bookwitch Towers courtesy of the goody bag from Bloody Scotland. Twice, I believe. It’s quite a good magazine. Even the Resident IT Consultant shares this opinion, and he is hard to please. 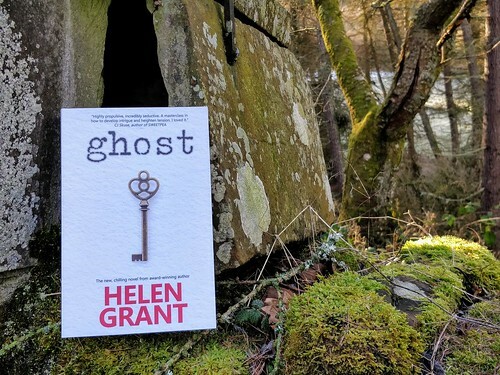 It was only as I read the article about Helen, and the other author that month, Noëlle Harrison, that I realised it was romance in books for Valentine’s Day. It’s a lovely idea, and it’s sure to have inspired a few people to get hold of their books. But as the Resident IT Consultant said, did they realise what kind of book Ghost is? When I told Daughter, she laughed out loud. An interest in gothic stories should always be viewed with some suspicion. Let’s just say that if I’d not known more and simply read Ghost for the romance, I’d have been in for a shock. Actually, I did know more, and I was still shocked. As were Daughter, and the Resident IT Consultant. I loved Ghost. I just don’t believe I’d ever suggest it as reading material for Valentine’s. Helen’s fondness for the dramatic Scottish landscape and for atmospheric ruins ought to give the game away. I wonder if anyone complained? To the Scots Magazine, I mean. It seemed appropriate that Joe Dunthorne – an author I know nothing about, I’m afraid – should write in ‘Made in…’ for Saturday’s Guardian Review about setting books in Santiago de Compostela, Tokyo and Oaxaca, but that it wasn’t until he went home to Swansea that he was in the right place. I once wrote one chapter of a novel set in Los Angeles. I was maybe thirteen. Still haven’t been to LA, but if I had, I don’t believe it would help. Not even if I could write fiction. When Adrian McKinty returned to Carrickfergus and installed his detective Duffy in the house where he, Adrian, was born, his novels got even better. Nothing wrong with New York, or Colorado, or places you arrive in via a wormhole in space, but you can’t beat your home town. This week I’ve been reading Christoffer Carlsson’s new crime novel. I won’t review Järtecken here yet, as it’s not out in English. But watch this space. After four crime novels set in Stockholm, where he lives now, he’s gone home. 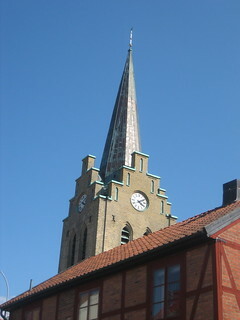 Home to Halmstad and the woods just outside this town on the west coast of Sweden. And the difference is obvious. But now, I’m back in a place that I don’t share with very many friends. I think back to it, yes. Not so much reminiscing with anyone, though. Sure, Christoffer is thirty years my junior, and he might very well have moved a bus route, lost a head prosecutor and perhaps uses slang that is too recent for the 1990s. But it’s still home. Much as I dislike woods, I may have to traipse round to his and have a look around. And as one of the suspects says, it’s not very easy to say what you did on a specific date ten years earlier [except he can]. Christoffer has used a date for that conversation, where I can say exactly what I was doing. And so, I dare say, can most of the population of Sweden. That’s a clever way of doing things. And it’s home. I hope there will be more.